Citation: C N Trueman "Leonid Brezhnev"
Leonid Ilyich Brezhnev was the archetypal Soviet politician associated with classic Cold War politics in the 1970’s. Seen as a hard line Communist, Brezhnev initially showed no intention of lessening the Cold War but by the time of his death, Brezhnev had met Richard Nixon, the US President, and some detected a thaw in relations between the Soviet Union and the United States. Brezhnev was born in 1906 in Dneprodzerhinsk in the Ukraine. He studied engineering at his birthplace and worked in a metallurgical factory before becoming a Communist Party official in 1938. During the ‘Great Patriotic War’, Brezhnev served on the frontline as a political commissar and held the rank of colonel. Brezhnev knew Nikita Khruschev and it was Khrushchev who helped to advance Brezhnev’s career when he was elected to the Supreme Soviet in 1950. Seemingly in favour with Joseph Stalin – something that could never be guaranteed as the dictator neared the end of his life – Brezhnev was appointed to the Party Central Committee in 1953. By 1957, Khrushchev was one of the most powerful men in Soviet politics and it surprised few that Brezhnev was appointed to the Politburo in that year. Brezhnev was very much seen as being a supporter of Khrushchev. In May 1960, Brezhnev was appointed President of the Presidium of the Supreme Soviet. This made him the head of the Soviet state though this was purely in an honorific capacity. Brezhnev held this post until July 1964. During this time Brezhnev was Khruschev’s deputy and he used his position to gain control over the party machine. The end of the Cuban Missile Crisis was seen as a climb-down and embarrassment in Moscow and Khruschev was made to take the blame. While his political career did not end immediately, he no longer commanded respect or authority in the higher echelons of Soviet politics. On October 15th 1964, Brezhnev succeeded Khruschev as First Secretary of the Soviet Communist Party. While on paper he shared power with Prime Minister Kosygin, he emerged as the most powerful man in Soviet politics. Brezhnev was a politician who had emerged at national level during the Cold War and led the USSR as the Cold War developed throughout the 1960’s. It was a dangerous era as a result of the nuclear arms racebetween the USA and USSR. There was a great growth in the production of nuclear missiles including ICBM’s, submarines that carried nuclear missiles and bombers capable of delivering nuclear bombs. During the 1960’s Brezhnev did little to thaw relations between East and West. The Six Day War in the Middle Eastsaw Arab states equipped with Soviet weapons as Moscow tried to expand its influence in the region. Israel was being aided and equipped by the USA. The invasion of Czechoslovakia in 1968 and the removal ofDubcek from office seemed to confirm all that Washington and London feared. The grip of communist controlled secret police forces in Eastern Europe seemed relentless. By the end of the 1960’s there was nothing obvious to indicate that Brezhnev wanted a move towards what became known as détente, though the SALT talks had started in 1969. He was seen as a hard liner and a change in the Soviet Constitution in 1977 allowed Brezhnev to further entrench his already very powerful position in Moscow. However, the cost of the Cold War was spiralling out of control in the USSR. Whereas the USA had the economic base to cope with the cost, the USSR did not. While meetings between Russian and American leaders are now seen as commonplace and barely make the news, the meetings between Nixon and Brezhnev were clearly extremely important if only that they broke the ice and may have done something to lessen suspicion between both nations. In 1972, Nixon visited Moscow while a year later Brezhnev visited Washington and stayed at Camp David. In 1974, Nixon once again visited Moscow and a year later the USSR, USA and the major European nations signed the Helsinki Agreement that recognised European borders as they stood after World War Two. The Helsinki Agreement also gave basic human rights to the people of Eastern Europe. Despite their very different backgrounds, it is said that Nixon and Brezhnev got on well at a personal level – at least, this was the image portrayed by the media. However, the simple fact that both men met was a significant step and while a number of years passed before the end of the Cold War was declared – and the world was still to face significant Cold War threats – the man who is seen as the archetypal Cold War warrior has to be credited with some part in the thaw that developed between the USSR and USA. 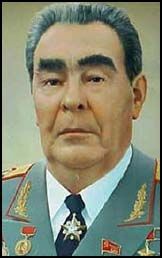 Leonid Brezhnev died on November 10th 1982.